Every serious tennis player aspires to hit huge forehands and powerful backhands. We see the pros doing it on TV and we want it for ourselves. Many club players I know have tried all kinds of tricks and gimmicks to improve power, but with little or no results. Well, I’ve got a permanent solution you can take to the bank. If you haven’t given much thought to rotation of the body while hitting, then this article is going to be a serious wake-up call. Body rotation on both the forehand and backhand sides are what really generate effortless power in tennis. In this post, I am going to talk about three specific rotations you can use on each side to measurably increase your groundstroke speed. In my opinion, there are two major contributing factors to groundstroke velocity: racket head speed and body rotation. 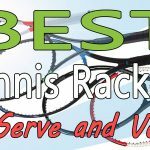 Achieving high levels of racket head speed like Rafael Nadal or Jack Sock is a skill most club players will never approach. It requires great technique, fast-twitch muscles and athleticism. If you don’t have those traits, your basically out of luck. Now that sounds a bit discouraging for your average club tennis player. But don’t despair. I have a solution that will work for everyone! What’s the solution? It’s body rotation and anyone can do it no matter age, athletic ability or skill level. 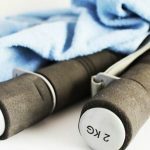 If you can learn to rotate your body and sequence it with hitting the ball at the correct time, you can boost your pace by as much as 20-30%! That’s the difference between hitting a full out winner or just another shot your opponent gets back. 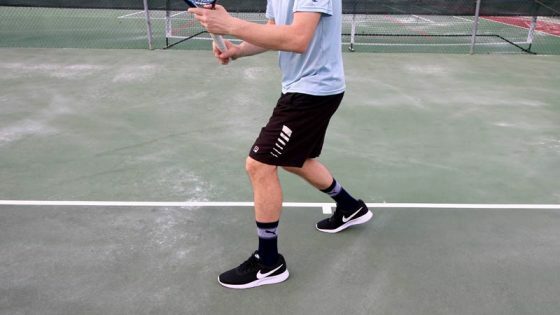 For a long time, I thought that keeping both feet on the floor was very important for hitting consistent groundstrokes. After all, we derive most of our power from the ground. This fact cannot be disputed; we need the ground to push off from to achieve power. As a result, I thought both feet on the ground would provide more power when hitting. But when I carefully studied the professional players hitting their groundstrokes, I saw different. I discovered it’s actually more advantageous to hit on one leg in most situations. Hitting on one leg allows for better body rotation. The foot that remains on the floor acts as a pivot, swiveling around so the body can rotate. If that’s the case, the body acts like a top being spun. I noticed a big difference in my power when using one-foot rotations. I started teaching them to my students and the difference in power was night and day. The best players in the world all use various rotations to maximize their power. When Novak Djokovic hits his two-handed backhand (perhaps the best in the world), he swivels on his front leg, allowing his full body weight to be distributed into the ball. You would rarely see a club player hit like that. I think a lot of people who watch professional tennis only focus on the ball. They should focus on the players’ footwork and rotations instead. This is where the true power comes from. The racket head speed is just the cherry on the cake. If you swing with medium-paced racket speed but use a heavy racket and rotate your body effectively, you can still hit heavy groundstrokes. We’re going to get into the details of rotation now on both the forehand and backhand wings. While there are many different rotations that can be used, I want to talk about two on the forehand side and one on the backhand side. I believe anyone can do this (from kid to senior) and it can be learned quite quickly. 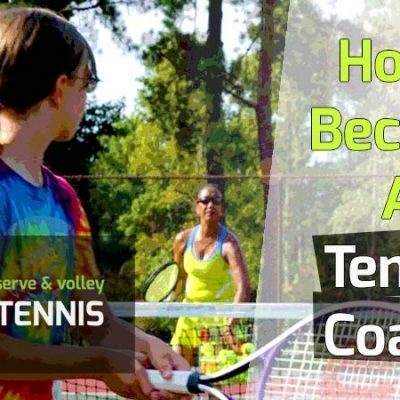 If you’ve been lacking power in your groundstrokes, the rest of this post is a must-read for you. 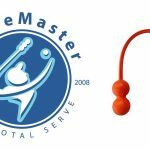 Your tennis game will never be the same after using this information! The player does not set up in the correct stance to allow proper rotation. 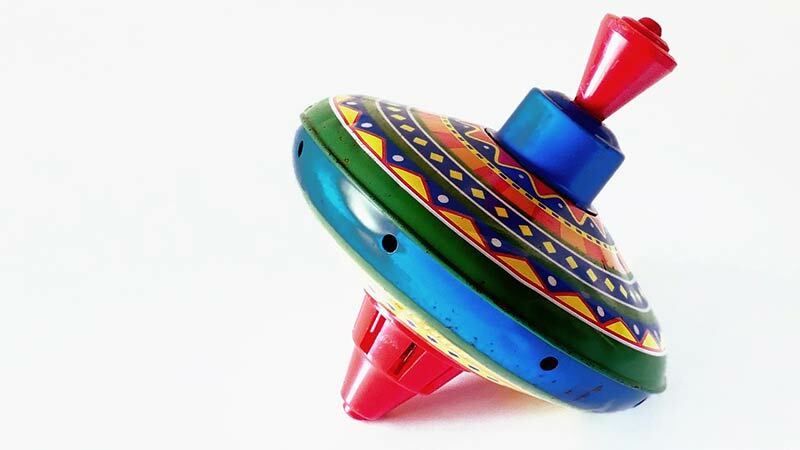 The timing of the rotation is too early or too late to allow for maximum power. The player does not raise the non-pivoted foot off the floor enough to allow the body to fully rotate. 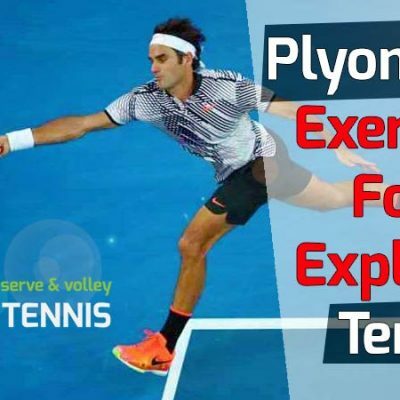 Let’s talk about the first type of rotation, which is the basic forehand that you have time to set up for. In this type of forehand, we’re going to use a semi-open forehand stance. To achieve the semi-open forehand stance, face the net and place both feet slightly wider than shoulder width. For right-handed players (lefties do the opposite of all instructions in this blog post), move your left foot forward so it’s several inches in front of your right foot. This is the basic position of the feet. Next, we’re going to make sure our toes are pointed in the right direction. The right foot should be at a 45-degree angle to the baseline. The left foot will be pointed slightly more to the net at around a 60-degree or more angle off the baseline. 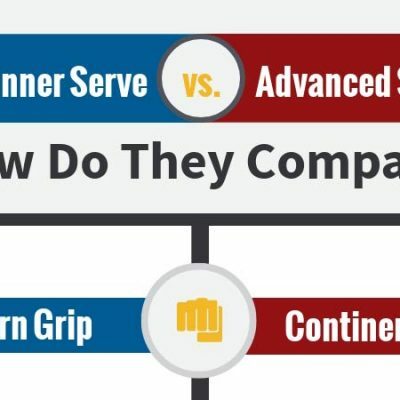 Once we achieve the semi-open forehand stance, we should be in our full power position. The power position is the last position we take with our body and racket before the forward movement into the ball. 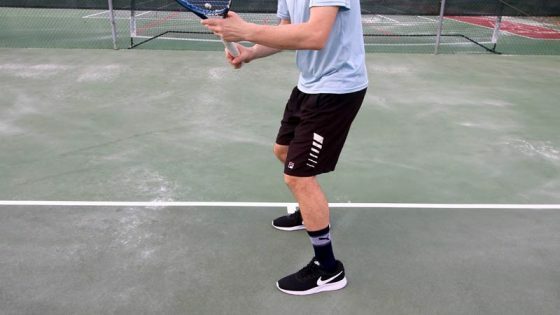 This blog post is all about the footwork and rotation of the groundstrokes, so I won’t get into the details of forehand mechanics. If you want to know how to hit a proper forehand, please see my youtube video series on how to hit an ATP style forehand. At this point, you’ll be in the semi-open stance and your power position. As you poise to strike the ball, the majority of your weight should be on your right foot (again, lefties do the opposite of all instructions in this post). We’re going to transfer our weight to the front (left) foot soon. Now here’s the part that takes coordination and timing. Right before you strike the ball, you’ll raise your right foot off the ground. This will take your weight off the right foot and distribute it into the ball. This is where the true power comes from – your entire body. The moment you make impact, and for perhaps a short time after (a quarter to half a second), you may even be off your left foot too. This is perfectly fine. If you watch Djokovic rotate out of the semi-open stance in slow motion, you’ll notice he does the same. If you’re left foot remains on the ground during the shot, don’t worry. That’s perfectly acceptable. You just want the majority of your weight going from the right foot to left foot. The key takeaway is that your right foot needs to leave the ground with your left foot acting as the pivot. 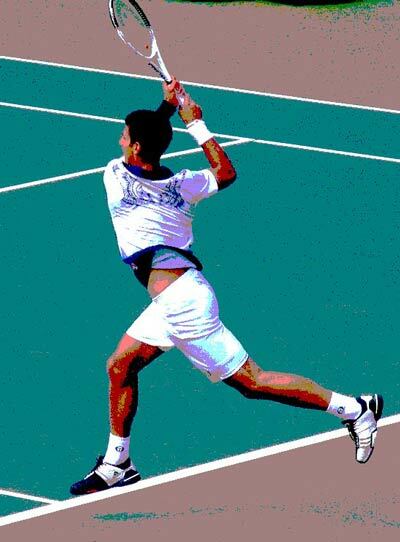 If your left foot leaves the ground (like Djokovic), when it touches down it will be facing about 90 degrees around. For example, say it was facing 60 degrees to the right when setting up to hit the ball. After the stroke is completed, it will be facing about 150 degrees to the left. The same can be said for the right foot. At the completion of the stroke, almost all your weight will be on the left foot. Most players find their right foot returns to the ground only on the front toe (with the foot almost perpendicular to the ground). How about the shoulders? When in the power position, the shoulders will be more corked than the feet. A great shoulder rotation is 145 degrees away from the net. Slightly less is acceptable, but not less than 100 degrees. At the completion of the stroke, the shoulders should be approximately 80 degrees to the net in the opposite direction! If we can rotate our shoulders that far, they would move an incredible 225 degrees during the stroke. That’s a lot of rotation into the ball. Club players will likely achieve less rotation, but if you can manage near 200 degrees, that would still be very effective. If you suffer from power issues on your groundstrokes, your shoulders are probably rotating a lot less than that amount. I know this is a lot of information to take in. Two things though. 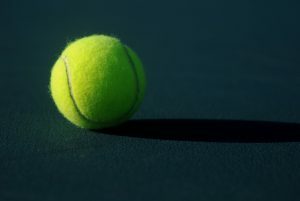 One is that rotation into the ball is quite natural if you play tennis. We just need to do it correctly. Second is seeing pictures and video of the correct way to rotate in the semi-open forehand stance will give you a much clearer understanding of what needs to be done. I urge you to practice this over and over, as it requires a lot of time to get right. While this can be thought of as a pivot shot off the left foot, it can also be seen as a transfer of weight, jumping from the right foot onto the left foot. Remember, the key objective is to transfer your weight into the ball to hit with more power. Whether you jump or pivot does not matter so much. The rotation is what’s important. This is one of my favorite rotations to do. It happens when your opponent hits a wide forehand that you hit on a slow-to-medium speed run. Here’s how it usually happens. You’re around the mid-line when someone hits a shot near the sideline or a little inside it. It’s on your forehand side, so you run to your right (lefties do the opposite) and hit the forehand with almost no power. Why? The most probable answer is that you didn’t prepare early and didn’t transfer your weight into the ball. I see this happen at the club level all the time. I would say most club players don’t know much about footwork and body position. This is why their technique is often so poor. The information I’m going to share here will enable you to hit a forehand on the run with a lot of power. You’ll know exactly what steps to take after reading this post. Best of all, you’ll actually be able to turn defense into offense with this one rotation. So don’t overlook it. Alright, first thing’s first. Say you’re at the mid-line, by the baseline. As soon as you see the ball hit wide to your forehand, you should pivot onto your outside foot (for righties, it’s the right foot). As the pivot is being made, lift your racket up and to the right side of your body, slightly away from your body. 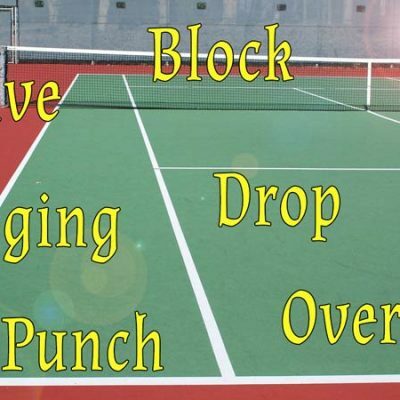 This helps prepare you to hit the forehand when you get to the ball. Now take a crossover step and run to the ball. As you set up for the ball, keep in mind your right foot will be the pivot foot. Wherever you plant your right foot, that’s where you’ll hit from. As you plant your right foot, place most or all your weight on it. 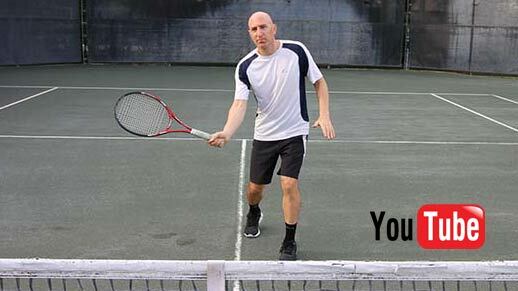 As you set up to hit the forehand, almost all your weight will now be on the right foot. While taking your swing, you’ll be entirely on one foot (the right foot). Allow that right foot to act as a pivot by placing most of your weight on the ball of the foot. If you plant your foot with too much weight on the heel, it won’t pivot and turn. As you make contact with the ball, really allow your body to turn with the right foot, which is serving as the pivot. The right foot should be turning with your body so that the toe will be facing to the left when the shot is complete – as should your body. Once you complete the stroke, quickly get to the ready position and then cross-step back to the middle. I know many teaching pros don’t teach this particular rotation, but it’s very effective. 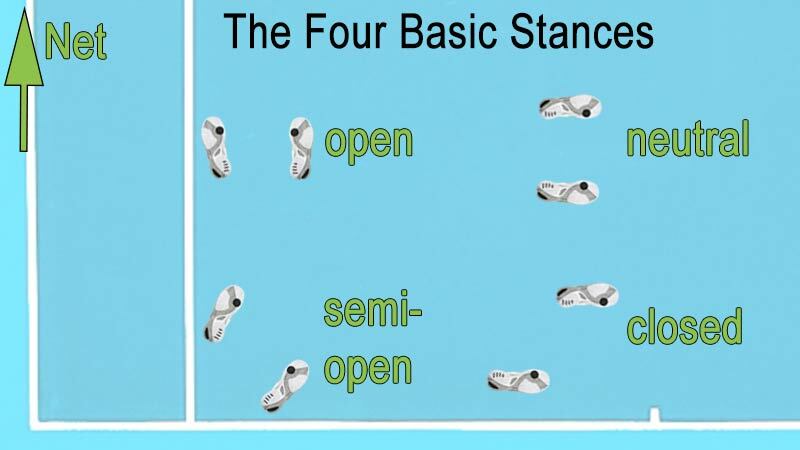 For this rotation, unlike the first one we learned out of the semi-open stance, your right foot will remain on the floor the whole time. You should not be jumping on this rotation for several reasons. One is that you’ll likely be off balance, affecting your timing on the shot. 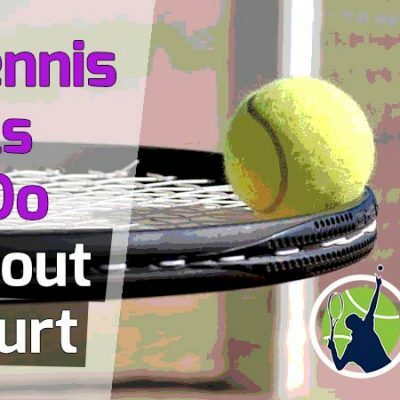 The second is that you’ll probably be taken too far off court to effectively recover. The third is that it takes too much energy to jump. 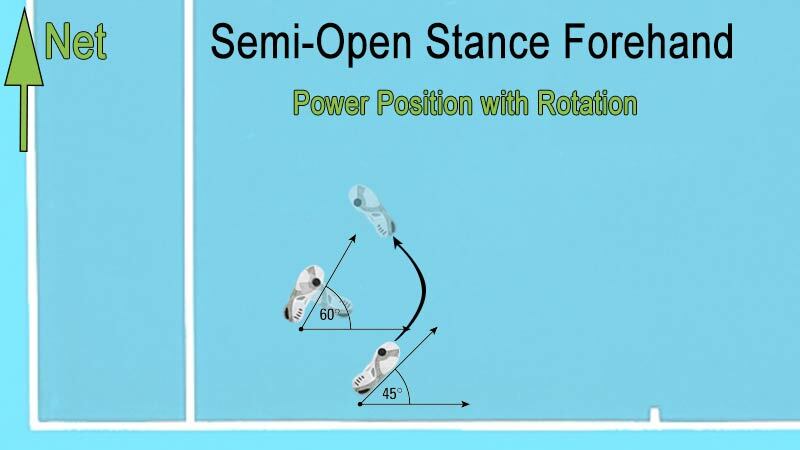 This rotation relies heavily on the right foot to act as a pivot. 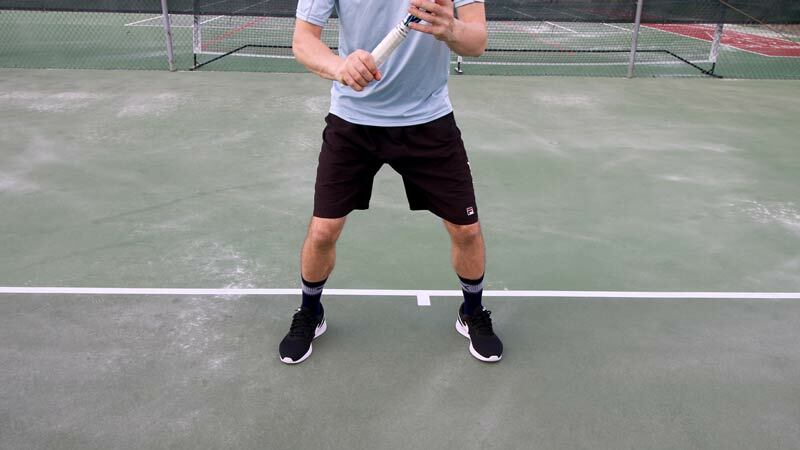 You can even use it on forehands where you need to back straight up or diagonally (out wide and back). Practice this rotation by making slow shadow movements over and over until you feel the footwork is grooved into memory. Then have someone feed you slow-to-medium paced shots out wide so you can practice it. I personally use this rotation quite often in my play. I find it makes hitting passing shots a lot easier. It also takes my opponents by surprise often, as they are not expecting how much power I can generate off the run. I taught this rotation to a few of my best child students (both 10-years-old) and they experienced great results with it too. Try it out and see for yourself. Most tennis coaches and analysts would agree that Novak Djokovic has the best two-handed backhand in tennis. Yes, his form and racket speed are superb. But the true key to his mastery of the backhand is how beautifully he rotates his body into the ball with precision timing. I truly believe if we want to play like the pros, we must try and hit like them. The backhand rotation I’m going to talk about here is valid for two-handers only. A one-hander does not have to rotate nearly as much. This rotation is good for any backhand that you require more power on. It could be on a shot near you or a bit further away. In a way, it’s similar to the forehand rotation out wide. This backhand rotation will require you to hit out of a closed or neutral stance – slightly closed is preferred. Here’s how it works. When the ball is hit to your backhand, move to it. As you begin to set up, make a unit turn with most of the weight on your back foot (your left foot). Your right foot will be off the ground and stepping forward. As your right foot (front foot) lands on the court, your left foot will come off. At this point, your front foot (right) will act as the pivot, so make sure you’re mostly on the ball of the foot. It’s very important you get these steps correct, because it initiates the weight transfer forward. All of this is easier said than done. It may take some time to get right, but it’s well worth the effort with the amount of power you can generate. For most players taught from an early age, this footwork is completely natural. If you are learning it as an adult after playing for many years, it will be a challenge. Keep at it though! Now back to the stroke. As you swing forward, you’ll be on your front foot. Allow it to swivel along with your body. Your body should finish with your chest facing the right net post. As you finish the stroke, your left (rear) leg will come around to your left side and you may finish close to feet parallel (like in the ready position). Every stroke in tennis is slightly different, so there’s no one hard rule on where your body and foot position should finish all the time. Again, the key point for this rotation is to allow the body to provide the power and not the racket or arms. You really need to allow the foot to act as a pivot for this to happen, so hit on the ball of the foot only. One other important point. I see some players hitting their two-handed backhands by coordinating their rackets and bodies to move at the same speed. That’s incorrect. You always want to move the racket faster. The body comes through last as a result of the momentum created in hitting the stroke. I just wanted to mention this, as it’s a common problem with two-handed backhand players at the club level. 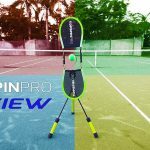 While there are many rotations you can use in tennis, I find these three to be the most common and most useful. Read this post again, look at the pictures and watch the videos for best learning. Practice the footwork alone first and then do it in a controlled environment with someone feeding you. 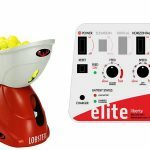 A ball machine like the Lobster Elite Liberty works great too. The next step would be to try out the rotations in practice and then finally in a match. 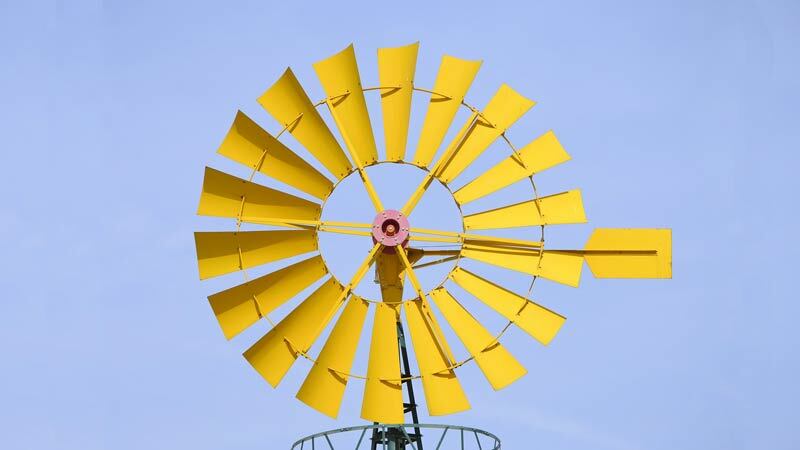 Imagine how great the feeling will be when you use one of these rotations to hit a clean winner with almost effortless power? You’ll certainly think it was well worth the work and effort at that point. As a club player who learned tennis on my own, I can tell you these rotations absolutely took my game to the next level. Try them. Practice them. And use them to defeat your foes! You are correct, Brian. I do agree with you that the core drives the rest of the body, including the feet. But it’s helpful for people to know which position to start the feet from. And it’s also helpful to know where they finish. Thanks for leaving a comment and stopping by my blog.